Fedora is a popular Linux distribution developed by the community-supported Fedora Project and is sponsored by Red Hat. Fedora attempts to maintain a six-month release schedule, offering new versions in May and November, although some releases have experienced minor delays. ^ At the time of release. Supported releases are often updated to the latest stable version of the Linux kernel. Releases of Red Hat Linux are listed here. Fedora 29 was released on October 30, 2018 . Fedora 28 was released on May 1, 2018.
Notable new features: a modular software repository, curated 3rd-party software repositories. Fedora 27 was released on November 14, 2017. The Workstation edition of Fedora 27 features GNOME 3.26. Both the Display and Network configuration panels have been updated, along with the overall Settings panel appearance improvement. The system search now shows more results at once, including the system actions. This release also features LibreOffice 5.4. Fedora 26 was released on July 11, 2017. Fedora 25 was released on November 22, 2016. Some notable changes (see  for more) are the use of the Wayland display system, Unicode 9, PHP 7.0, Node.js 6 and IBus Emoji typing. Fedora 24 was released on June 21, 2016. Some notable system wide changes (see  for more) are the use of GNOME 3.20, GCC 6, and Python 3.5. Fedora 23 was released on November 3, 2015. It comes with LibreOffice 5. The Fedora release updater, fedup, was integrated into DNF. It uses a Python3 (specifically python3.4.3) as the operating system's default Python implementation. Fedora 22 was released on May 26, 2015. Fedora 21, the first version without a codename, was released on December 9, 2014. Fedora 20, codenamed "Heisenbug", was released on December 17, 2013. Fedora 19, codenamed "Schrödinger's Cat", was released on July 2, 2013. Red Hat Enterprise Linux 7 and other derivatives are based on Fedora 19. Fedora 18, codenamed "Spherical Cow", was released on January 15, 2013. The next release of the operating system was Fedora 17, codenamed "Beefy Miracle", which was released on May 29, 2012. Fedora 16, codenamed "Verne", was released on November 8, 2011. Fedora 16 was also dedicated to the memory of Dennis Ritchie, who died about a month before the release. Fedora 14, codenamed Laughlin, was released on November 2, 2010. Fedora 13, codenamed "Goddard", was released on May 25, 2010. During early development, Fedora project-leader Paul Frields anticipated "looking at the fit and finish issues. We have tended to build a really tight ship with Fedora, but now we want to make the décor in the cabins a little more sumptuous and to polish the deck chairs and railings." Fedora 12, codenamed Constantine, was released on November 17, 2009. Red Hat Enterprise Linux 6 and other derivatives are based on Fedora 12. Fedora 11, codenamed Leonidas, was released on June 9, 2009. This was the first release whose artwork is determined by the name instead of by users voting on themes. faster bootup aimed at 20 seconds. nVidia kernel modesetting through the open source nouveau (graphics) driver. Fedora 9, codenamed Sulphur, was released on May 13, 2008. KDE Plasma 4.0, which is the default interface as part of the KDE spin. OpenJDK 6 has replaced IcedTea. PackageKit is included as a front-end to yum, and as the default package manager. One Second X allows the X Window System to perform a cold start from the command line in nearly one second; similarly, shutdown of X should be as quick. Many improvements to the Anaconda installer; among these features, it now supports resizing ext2, ext3 and NTFS file systems, and can create and install Fedora to encrypted file systems. Firefox 3.0 beta 5 is included in this release, and the 3.0 package was released as an update the same day as the general release. Perl 5.10, which features a smaller memory footprint and other improvements. Data Persistence in USB images. Fedora 9 featured a new artwork entitled Waves which, like Infinity in Fedora 8, changes the wallpaper to reflect the time of day. Fedora 8, codenamed Werewolf, was released on November 8, 2007. PulseAudio – a sound daemon that allows different applications to control the audio. Fedora was the first distribution to enable it by default. system-config-firewall – a new firewall configuration tool that replaces system-config-securitylevel from previous releases. Codeina – a tool that guides users using content under proprietary or patent-encumbered formats to purchase codecs from fluendo; it is an optional component that may be uninstalled in favor of GStreamer codec plug-ins which are free of charge. IcedTea – a project that attempts to bring OpenJDK to Fedora by replacing encumbered code. NetworkManager – faster, more reliable connections; better security (through the use of the keyring); clearer display of wireless networks; better D-Bus integration. Better laptop support – enhancements to the kernel to reduce battery load, disabling of background cron jobs when running on the battery, and additional wireless drivers. Fedora 8 also included a new desktop artwork entitled Infinity, and a new desktop theme called Nodoka. A unique feature of Infinity is that the wallpaper can change during the day to reflect the time of day. In February 2008, a new Xfce Live CD "spin" was announced for the x86 and x86-64 architectures. This Live CD version uses the Xfce desktop environment, which aims to be fast and lightweight, while still being visually appealing and easy to use. Like the GNOME and KDE spins, the Xfce spin can be installed to the hard disk. Fedora 7, codenamed Moonshine, was released on May 31, 2007. The biggest difference between Fedora Core 6 and Fedora 7 was the merging of the Red Hat "Core" and Community "Extras" repositories, dropping "Core" from the name "Fedora Core," and the new build system put in place to manage those packages. This release used entirely new build and compose tools that enabled the user to create fully customized Fedora distributions that could also include packages from any third party provider. Everything – simply an installation tree for use by yum and Internet installations. Fedora 7 featured GNOME 2.18 and KDE 3.5, a new theme entitled Flying High, OpenOffice.org 2.2 and Firefox 2.0. Fast user switching was fully integrated and enabled by default. Also, there were a number of updates to SELinux, including a new setroubleshoot tool for debugging SELinux security notifications, and a new, comprehensive system-config-selinux tool for fine-tuning the SELinux setup. These two Core releases introduced specific artwork that defined them. This is a trend that has continued in later Fedora versions. Fedora Core 5 was released on March 20, 2006, with the codename Bordeaux, and introduced the Fedora Bubbles artwork. It was the first Fedora release to include Mono and tools built with it such as Beagle, F-Spot and Tomboy. It also introduced new package management tools such as pup and pirut (see Yellowdog Updater, Modified). It also was the first Fedora release not to include the long deprecated (but kept for compatibility) LinuxThreads, replaced by the Native POSIX Thread Library. Fedora Core 1 was the first version of Fedora and was released on November 6, 2003. It was codenamed Yarrow. Fedora Core 1 was based on Red Hat Linux 9 and shipped with version 2.4.19 of the Linux kernel, version 2.4 of the GNOME desktop environment, and K Desktop Environment 3.1. Fedora Core 2 was released on May 18, 2004, codenamed Tettnang. It shipped with Linux 2.6, GNOME 2.6, KDE 3.2, and SELinux (SELinux was disabled by default due to concerns that it radically altered the way that Fedora Core ran). XFree86 was replaced by the newer X.org, a merger of the previous official X11R6 release, which additionally included a number of updates to Xrender, Xft, Xcursor, fontconfig libraries, and other significant improvements. Fedora Core 3 was released on November 8, 2004, codenamed Heidelberg. This was the first release of Fedora Core to include the Mozilla Firefox web browser, as well as support for the Indic scripts. This release also saw the LILO boot loader deprecated in favour of GRUB. SELinux was also enabled by default, but with a new targeted policy, which was less strict than the policy used in Fedora Core 2. Fedora Core 3 shipped with GNOME 2.8 and KDE 3.3. It was the first release to include the new Fedora Extras repository. ^ a b "Releases/HistoricalSchedules". Fedora Project. Retrieved 11 August 2015. ^ "End of life". Fedora Project. Retrieved 11 May 2014. ^ a b "Fedora". DistroWatch. Retrieved 15 May 2014. ^ "KernelRebases". Fedora Project. Retrieved 18 May 2014. ^ Boyer, Josh (2 October 2013). "Release Name process ended". Fedora community advisory board mailing list. Retrieved 11 May 2014. ^ "Releases/27/Schedule". Fedora Project. Retrieved 17 March 2017. ^ "Releases/28/Schedule". Fedora Project. Retrieved 15 August 2017. ^ "Releases/29/Schedule". Fedora Project. Retrieved 10 March 2018. ^ "Releases/30/Schedule". Fedora Project. Retrieved 19 August 2018. ^ "Releases/31/Schedule". Fedora Project. Retrieved 20 March 2019. ^ "Fedora 27 Schedule". Retrieved 11 April 2018. ^ "Fedora 26 Schedule". Retrieved 11 July 2017. ^ "Fedora 25 Schedule". Retrieved 25 December 2016. ^ "Fedora 25 Change Set". Retrieved 25 December 2016. ^ "Fedora 24 Schedule". Retrieved 25 December 2016. ^ "Fedora 24 Change Set". Retrieved 25 December 2016. ^ "Fedora 23 Schedule". Retrieved 3 November 2015. ^ "Fedora 23 Change Set". Retrieved 26 December 2016. ^ a b "Fedora 22 Released, See What`s New [Workstation]". Retrieved 28 May 2015. ^ "Fedora 22 is here!". Retrieved 28 May 2015. ^ Boyer, Josh (2 October 2013). "Release Name process ended". Fedora community advisory board (Mailing list). Retrieved 11 May 2014. ^ "Releases/21/Schedule". Fedora Project. Retrieved 25 March 2014. ^ "Results of Fedora 20 Release Name Voting". FedoraProject. 2013-09-03. Retrieved 2013-09-04. ^ "Releases/20/Schedule - FedoraProject". FedoraProject. 2013-11-12. Retrieved 2013-11-12. ^ "Fedora 20 features". FedoraProject. Retrieved 2013-10-05. ^ "Fedora 20 features: ARM as primary architecture". FedoraProject. Retrieved 2013-10-05. ^ "Fedora 20 features: Application Installer". FedoraProject. Retrieved 2013-10-05. ^ "Fedora 19 features: checkpoint restore". ^ "Fedora 18 features: IPAv3". ^ Phoronix. "Fedora 17 Released With Its Quirky Announcement". Retrieved May 29, 2012. ^ "Anatomy of a Fedora 17 ISO image". ^ "Fedora 17 on Macbook Air Native EFI Boot". ^ Phoronix. "Red Hat Releases Fedora 16 "Verne"". Retrieved November 8, 2011. ^ "Alpha version of Fedora 15 released - The H Open: News and Features". H-online.com. March 8, 2011. Archived from the original on September 18, 2012. Retrieved April 30, 2013. ^ "Fedora 15 Released – Includes Dynamic Firewall, GNOME 3 Among Other Features". Digitizor.com. May 24, 2011. Retrieved April 30, 2013. ^ "Fedora 15 Boosts Linux Security". eSecurity Planet. May 20, 2011. Archived from the original on January 22, 2013. Retrieved April 30, 2013. ^ "Announcing Fedora 12". Redhat.com. Retrieved April 30, 2013. ^ kkofler (February 27, 2010). "kdebase-4.4.0-5.fc13 bugfix update". Red Hat, Inc. Archived from the original on December 20, 2012. Retrieved May 31, 2010. ^ Kerner, Sean Michael (April 28, 2009). "Red Hat Fedora 11 Focuses on the Linux Desktop". internetnews.com. Retrieved April 30, 2009. ^ "Fedora 11 File systems". fedoraproject.org. Retrieved July 4, 2009. ^ "Fedora 11 - Eclipse". Fedora Project. Archived from the original on June 12, 2009. Retrieved June 15, 2009. ^ "Fedora 11 Accepted Features". Fedora Project. Retrieved May 18, 2009. ^ "Fedora 10 Release Schedule". The Fedora Project. September 24, 2008. Retrieved September 25, 2008. ^ "Fedora 10 Feature List". The Fedora Project. Retrieved November 30, 2008. ^ Jesse Keating (May 13, 2008). "The Prophecy of the 9 comes true (Fedora 9 walks the earth!)". Fedora Project. Retrieved May 13, 2008. ^ "Fedora 9 Release Notes". Fedora Project. Archived from the original on January 15, 2009. Retrieved May 13, 2008. ^ Wade, Karsten (March 13, 2008). "OpenJDK in Fedora 9!". redhatmagazine.com. Retrieved April 5, 2008. Thomas Fitzsimmons updated the Fedora 9 release notes source pages to reflect that Fedora 9 would ship with OpenJDK 6 instead of the IcedTea implementation of OpenJDK 7. 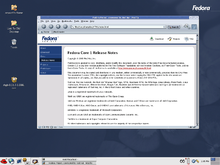 Fedora 9 (Sulphur) is due to release in May 2008. ^ "One Second X". Fedora Project. Retrieved May 9, 2008. ^ "Fedora 9 (Beta) Release Notes". Fedora Project. Retrieved January 4, 2008. ^ "How to create and use Live USB—FedoraProject". Fedoraproject.org. Retrieved December 1, 2008. ^ "Fedora Project Release Schedule". Retrieved October 7, 2007. ^ a b c d "Fedora 8 Release Summary". November 7, 2007. Retrieved November 7, 2007. ^ a b Rahul Sundaram (February 13, 2008). "Announcing Fedora 8 Xfce Spin". Fedora Project. Retrieved May 17, 2008. ^ a b c Fedora Project (May 31, 2007). "Announcing Fedora 7 (Moonshine)". Retrieved November 7, 2007. ^ a b c d Fedora Project. "Fedora 7 Release Highlights". Archived from the original on October 30, 2007. Retrieved November 18, 2007. ^ a b "Announcing the release of Fedora Core 5". March 20, 2006. Retrieved October 18, 2007. ^ "Fedora Core 5 Release Notes". Archived from the original on October 11, 2007. Retrieved October 18, 2007. ^ Fedora Project (October 24, 2006). "Announcing Fedora Core 6 (Zod)". Retrieved October 18, 2007. ^ a b Fedora Project. "Fedora Core 6 Release Notes". Archived from the original on October 20, 2007. Retrieved October 18, 2007. ^ Red Hat. "Fedora status report: Announcing Zod". Archived from the original on November 20, 2007. Retrieved October 18, 2007. ^ Red Hat (November 6, 2003). "Announcing Fedora Core 1". Retrieved October 18, 2007. ^ "Fedora Core 1 Release Notes". Archived from the original on December 2, 2003. Retrieved October 19, 2007. ^ a b Red Hat (May 18, 2004). "Presenting Fedora Core 2". Retrieved October 18, 2007. ^ a b "Fedora Core 2 Release Notes". Archived from the original on October 25, 2007. Retrieved October 19, 2007. ^ a b c d e Red Hat (November 8, 2004). "Announcing the release of Fedora Core 3". Retrieved October 18, 2007. ^ "Fedora Core 3 Release Notes". Archived from the original on October 25, 2007. Retrieved October 19, 2007. ^ a b Fedora Project (June 13, 2005). "The Amazing Fedora Core 4!". Retrieved November 18, 2007. ^ a b c d "Fedora Core 4 Release Notes". Fedora Project. Archived from the original on October 28, 2007. Retrieved November 18, 2007. This page was last edited on 29 January 2019, at 07:09 (UTC).